Interstate 65 connects the Deep South with the Midwest, providing a north-south connection from the ports of the Gulf of Mexico to the ports of the Great Lakes. Alabama’s main street, I-65 begins in the “Port City” of Mobile and runs northeast through wide swaths of pine forest to the capital of Montgomery. Beyond there, I-65 continues northward to the economic hub of the state in Birmingham before reaching the Huntsville area between Madison and Decatur. North of Huntsville and Interstate 565, I-65 passes through 120 miles of the Volunteer State with a direct line through Nashville. 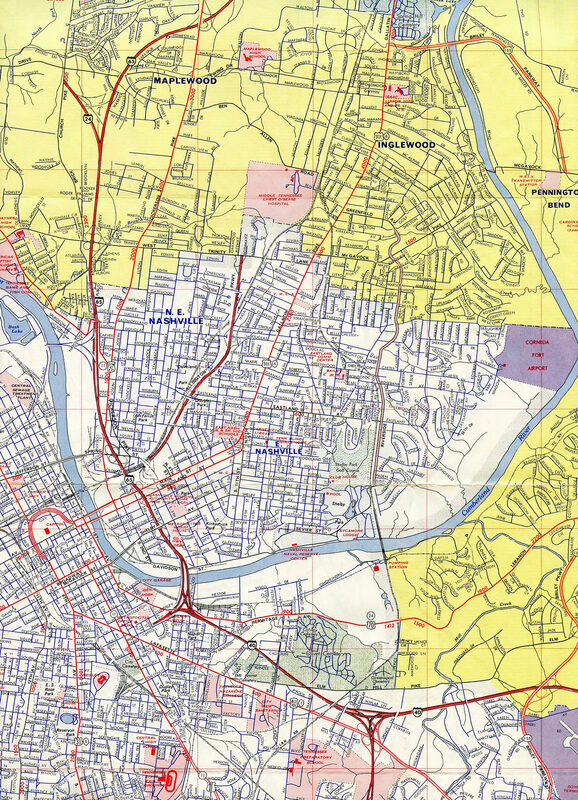 Within the Tennessee capital city, Interstate 65 changed alignments in 2000 to overtake the former Interstate 265 along the west side of the central business district. Beyond there, I-65 shares a short overlap with Interstate 24 in north Nashville before angling northeast toward the Bluegrass State. Traveling through Kentucky, Interstate 65 ventures across hilly terrain to Bowling Green and Elizabethtown. The freeway passes to the east of Fort Knox en route to Shepherdsville and the south suburbs of Louisville. 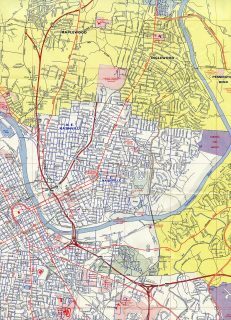 I-65 bisects Kentucky’s largest city before crossing the Ohio River into the Falls City area of southern Indiana. Leaving the Ohio Valley, Interstate 65 flattens out across agricultural areas by the smaller cities of Seymour, Columbus and Franklin while en route to Indianapolis. I-65, like I-70, travels through the heart of Indianapolis as Interstate 465 encircles the Circle City along a 57.5-mile beltway. Traveling northwest, I-65 again transitions into a rural freeway to Lebanon, Lafayette and Crown Point. The northernmost reaches of the freeway serve the industrial city of Gary in the eastern Chicago metropolitan area. Interstate 265 Connector/East End Bridge – Cost: $1.29 billion with a forecast completion of 2013. Interstate 65 Downtown Louisville Bridge Replacement – Cost: $868.4 million with a forecast completion of 2019. Interstate 64, 65, and 71: Reconstruct “Spaghetti Junction” – Cost: $1.74 billion with a forecast completion of 2024. Five of the six southbound lanes across the Ohio River opened to traffic along he rehabilitated John F. Kennedy Memorial Bridge bridge on October 10, 2016.10 All lanes and ramps on both spans and approaches were open by mid-November 2016, with the ramp from I-65 south to I-64 opened on November 14.11 All electronic tolling (AET) was implemented on the crossing on December 30, 2016. 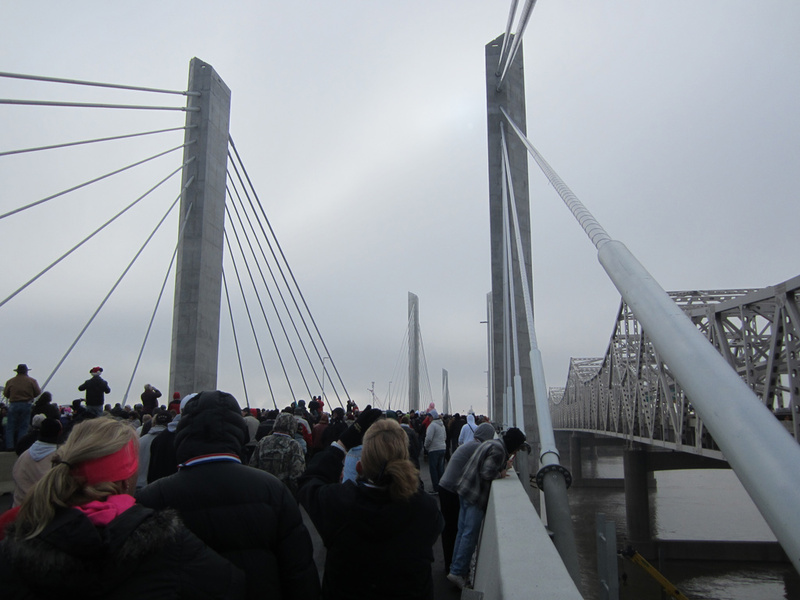 The north tower of the Abraham Lincoln Bridge during the public bridge walk held on December 5, 2015. Photo taken by Tom Reaugh. Interstate 65 parallels U.S. 31 for much of its route, with the exception of the stretch northwest of Indianapolis, where it parallels U.S. 52 (Indianapolis to Lafayette) and U.S. 231 (old U.S. 152 from Lafayette to Crown Point) and Mobile County, Alabama where it aligns west of U.S. 43 from Satsuma to Mobile. Warrior. Rounding out work was the 14-mile portion between Lewisburg and Warrior. Widening of Interstate 65 from four to six lanes between Exits 10 to 13 in Alabama was completed in 2003. 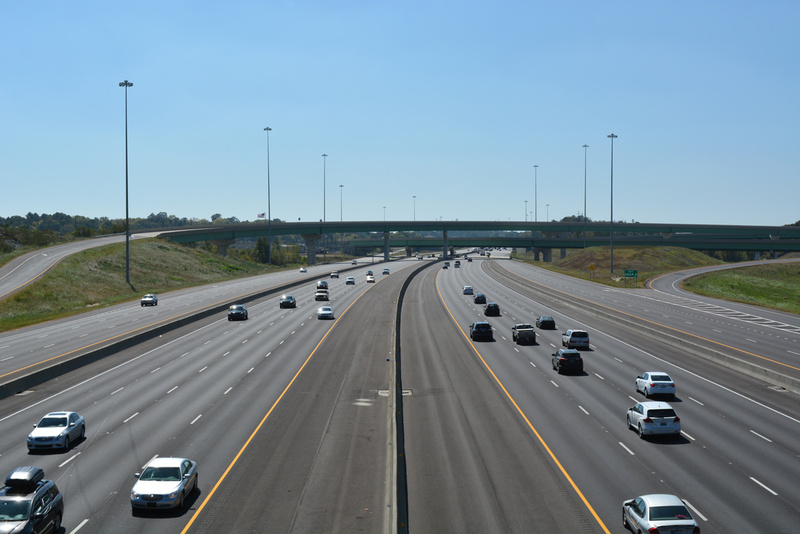 A $110-million project completed between 2006 and December 21, 2010 modernized and widened I-65 between Exits 168 and 173 through Montgomery. South of Birmingham in suburban Shelby County, Interstate 65 again widens to six lanes with an expansion project between Exits 242 and 250 completed in December 2011. Work further north expanded the freeway to eight lanes within the vicinity of Interstate 22, with construction of a multi-level stack interchange there underway to October 2015. Construction started in August 2010 expanded Interstate 65 between North Birmingham and Fultondale, Alabama. 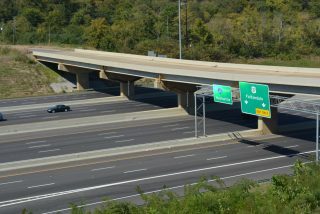 The project added c/d roadways to both directions of the freeway to connect with Interstate 22 at the directional T interchange pictured here. I-22 was completed on June 20, 2016. Photo taken 10/08/16. 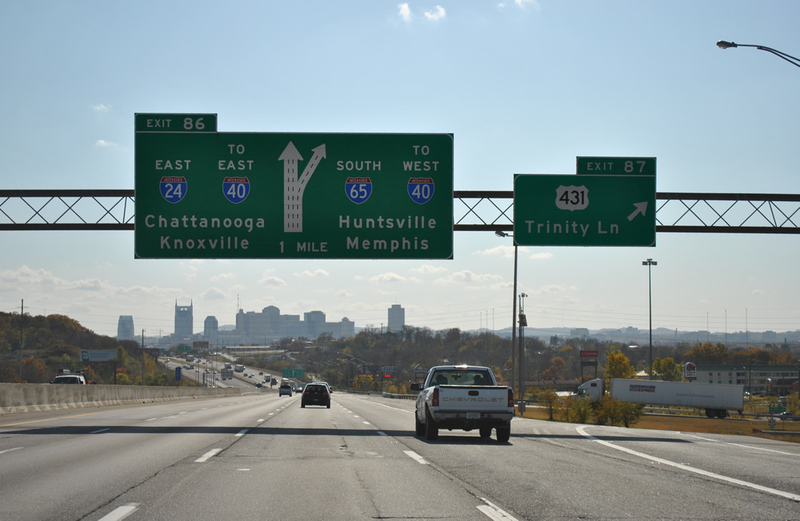 The first section of Interstate 65 to open in Tennessee was located at the Tennessee-Alabama line, and it opened to traffic on November 15, 1958. The 1.8-mile stretch cost $1.3 million to construct over an 18-month period (starting in May 1957). Interstate 65 between Elizabethtown and Louisville opened on August 1, 1956 as the tolled Kentucky Turnpike. Tolls were levied along the 39-mile road until June 30, 1975, when bonds that financed its construction were paid off. Interstate 65 at the 47th Avenue North overpass at Lewisburg in Birmingham, Alabama. Photo taken 10/08/16. 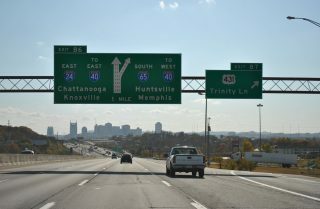 The Nashville skyline comes into view along the overlap of Interstates 24 east & 65 south at Exit 87. Photo taken 11/07/11. 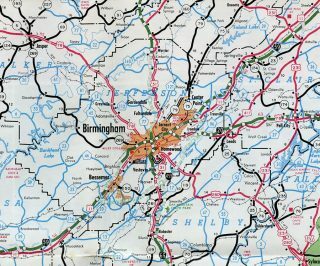 Prior to 2000, Interstates 24 & 65 continued together to Interstate 40, where I-24 turned east and I-65 turned west. The relocation of I-65 over I-265 to the west was undertaken in an effort to partition some of the through traffic around downtown Nashville. The 11.7 mile stretch of Interstate 65 between Hoover south to Alabaster, Alabama was completed on May 20, 1981. That opening was followed by the 14-mile portion from Lewisburg to Warrior, Alabama on December 19, 1985. Interstate 65 temporarily ending at Harding Place (Exit 78) in Oak Hill, to the south of central Nashville, in 1969. 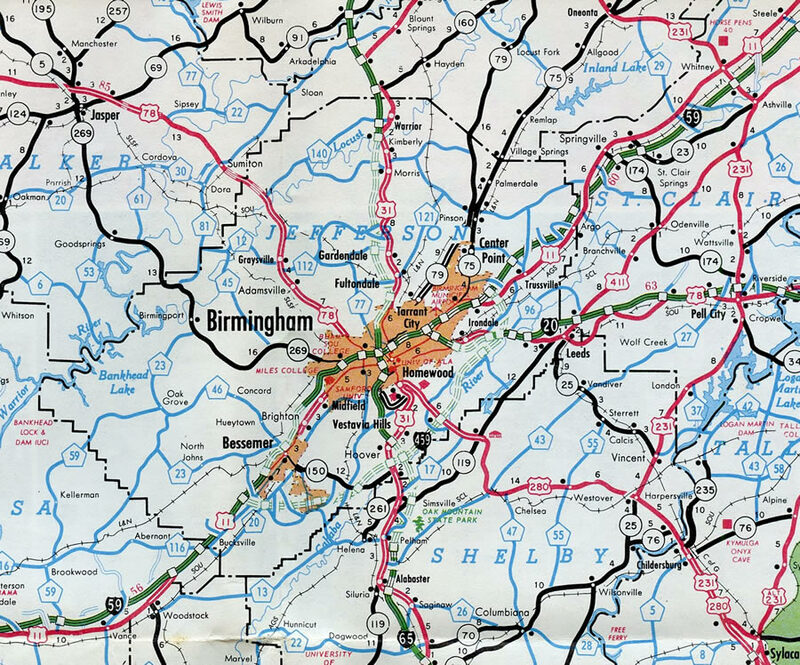 Interstate 65 was complete from Oak Hill south to Alabama and from north of the split with I-40 to U.S. 31W (Exit 98) near Millersville by 1970. The Abraham Lincoln Bridge and John F. Kennedy Memorial Bridges carry Interstate 65 across the Ohio River, linking Downtown Louisville, Kentucky with Jeffersonville, Indiana. 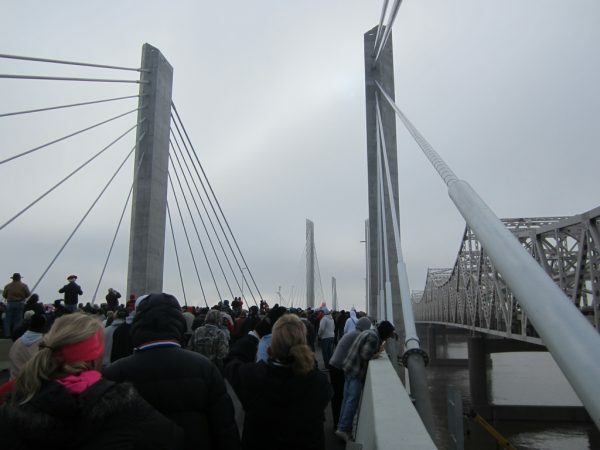 Photo taken during the public bridge walk held on December 5, 2015 by Tom Reaugh. The Kennedy Bridge opened to traffic for Interstate 65 on December 6, 1963. 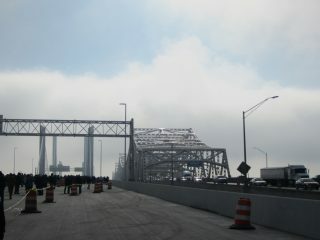 The bridge accommodated four northbound lanes and three southbound lanes until 2016, when it shut down for reconstruction and conversion to southbound only traffic. North of incomplete portions of Interstate 65 through the Circle City, I-65 was also nearing completion in 1974 from Lebanon north to U.S. 24 near Remington. U.S. 52 remains along its four-lane alignment parallel to this stretch today. Interstate 65 parts ways with Exit 259B for Interstates 80-94 & U.S. 6 east to their split at Lake Station. I-80 joins I-90 to South Bend and Toledo, Ohio while I-94 curves northward to St. Joseph, Michigan. I-65 concludes in two miles at Interstate 90 (Indiana Toll Road). Photo taken 11/05/09. Traveling a viaduct above a Norfolk Southern Railroad line and parallel Central Avenue, motorists on I-65 are advised of the final two exits: Exit 261 to 15th Avenue in Gary and Exit 262 for I-90 (Indiana Toll Road). Photo taken 11/05/09. The first of two end signs posted for Interstate 65. The freeway concludes one half mile north of a parclo interchange (Exit 261) with 15th Avenue. Photo taken 11/05/09. Exit 261 leaves Interstate 65 north for 15th Avenue. Forthcoming Exit 262 provides direct access to I-90 west to Hammond and Chicago and east to South Bend and Toledo, Ohio. Traffic otherwise ends at U.S. 12 & 20 (Dunes Highway) opposite Taylor Road. Photo taken 11/05/09. Exit 262 constitutes a wye interchange linking Interstate 65 with the toll plaza and access road from adjacent Dunes Highway to the Indiana Toll Road. Constructed between 2003 and 2004, this interchange replaced an at-grade intersection. Photo taken 11/05/09. Beyond the ramp to I-90, Interstate 65 concludes at a traffic light with U.S. 12 & 20 (Dunes Highway) and Taylor Road. Downtown Gary lies to the west and Aetna in east Gary to the east. Taylor Road ties in from an industrial site to the north. Photo taken 11/05/09. More photos from this perspective posted at the Interstate 65 North – Lake County highway guide. Interstate 65 north at the former intersection with the access road (Exit 262 to the Indiana Toll Road). This traffic signal was removed in 2003-2004 and replaced with an interchange. Photo taken by Brian Dowd (06/15/02). The first southbound shield for Interstate 65 stands to the immediate south of U.S. 12 & 20 (Dunes Highway). An adjacent right turn lane connects with a business as the freeway begins. Photo taken 11/05/09. 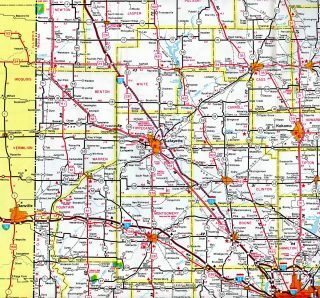 Additional content for the perspective southbound at the Interstate 65 South – Lake County highway guide. Southbound view of Interstate 65 at the former stoplight between the freeway end and Indiana Toll Road (Interstate 90). This signal was removed in 2003-04 and replaced with an interchange. Within Lake County, Interstate 65 is designated the Casimir Pulaski Memorial Highway. Photo taken by Brian Dowd (06/15/02). This guide sign directed traffic at the signalized intersection linking Interstate 90 with I-65 south. Photo taken by Brian Dowd (06/15/02). U.S. 12 & 20 exit Downtown Gary and combine from the one-way couplet of 4th & 5th Avenues to form the Dunes Highway eastward. Industrial frontage lines the highway east to the signalized intersection with Taylor Road north and I-65 south. Photo taken 09/03/05. 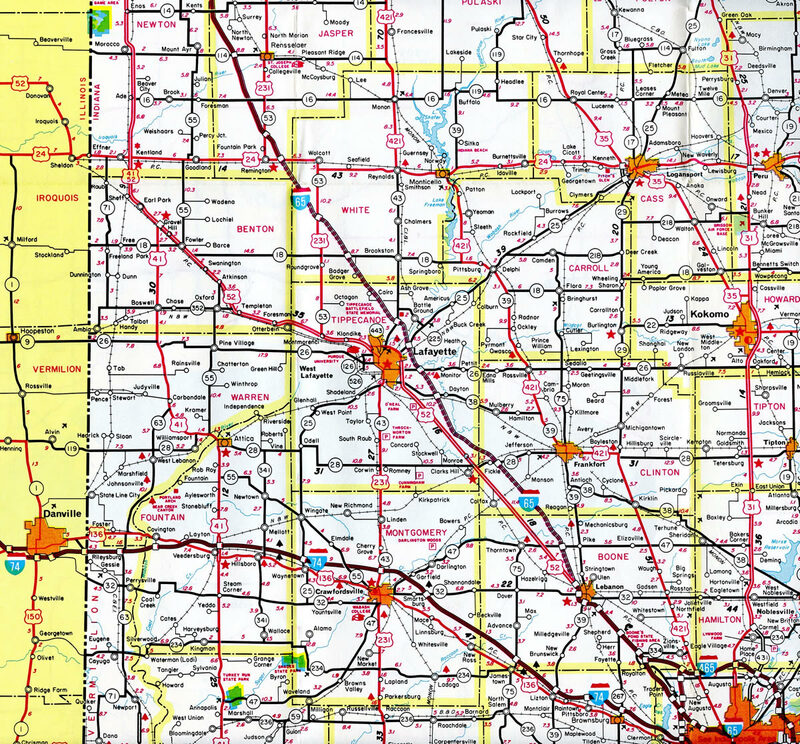 See the U.S. Highway 12 East – Lake County highway guide for additional photos from this perspective. U.S. 12 & 20 (Dunes Highway) westbound pass under Interstate 90 as a left turn lane commences for the southbound beginning of Interstate 65. Photo taken by Don Hargraves (09/23/02). An overhead directs motorists along Dunes Highway westbound to Interstate 65 south. I-65 meets 15th Avenue nearby. Photo taken 11/05/09. Additional photos from this perspective found at U.S. Highway 12 West – Lake County highway guide. U.S. 12 & 20 (Dunes Highway) westbound leaves the Aetna community of east Gary and approaches the trumpet interchange for Interstate 90 (Indiana Toll Road). 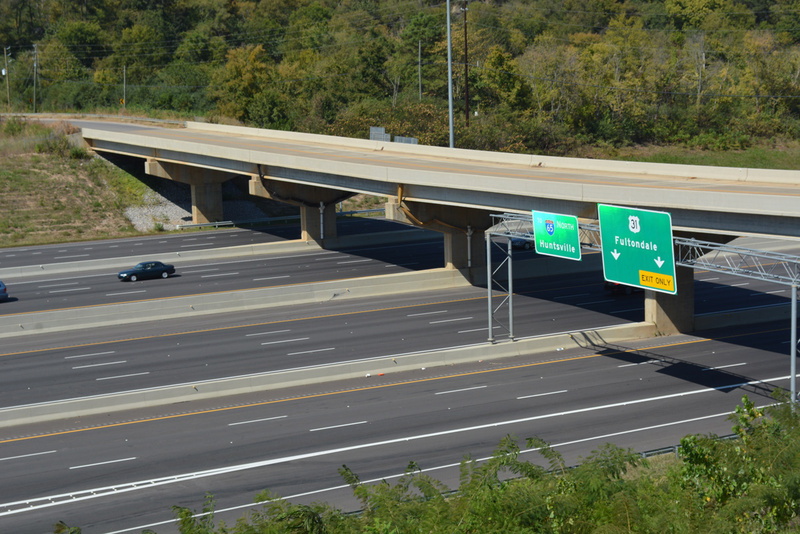 The sign bridge displaying advance overheads for I-65 south and the toll road was removed. Photo taken by Brian Dowd (12/26/02). One mile east of the Exit 17 interchange complex with Interstate 65 south and U.S. 12 & 20 (Dunes Highway) along I-90 near the 15th Avenue overpass in Gary. The capital city of Indianapolis is 139 miles to the southeast. Photo taken 09/02/05. Interstate 90 (Indiana Toll Road) curves northwesterly on the half mile approach to Exit 17. Exit 17 serves both I-65 south to Lafayette and U.S. 12 & 20 through Gary. Photo taken 09/02/05. 15th Avenue passes over Interstate 65 at the trumpet interchange for Exit 17. Originally the movement to I-65 south utilized a left turn onto the beginning freeway. I-65 continues two miles to I-80/94 & U.S. 6. Photo taken 05/09/10. See the Interstate 90 West – Lake Station to Chicago Skyway highway guide for photos from this perspective. One mile west of the trumpet interchange (Exit 17) and access road for Interstate 65 south and U.S. 12 & 20 (Dunes Highways). Photo taken 11/04/11. Turning southward on the half mile approach to Interstate 65 south along I-90 (Indiana Toll Road) east. U.S. 12 & 20 combine along Dunes Highway from Downtown Gary east to Aetna, meeting I-65 to the immediate north of Exit 17. East of Exit 17, U.S. 12 parts ways with U.S. 20, taking a northerly route through East Chicago, Gary, Portage, Burns Harbor as U.S. 20 parallels a short distance to the south. Photo taken 11/04/11. Exit 17 departs Interstate 90 east to a toll plaza and the ramp split for Interstate 65 south to Indianapolis and U.S. 12 & 20 in Gary. Photo taken 11/04/11. Traffic taking Exit 17 from the Indiana Toll Road separates with a wye interchange connecting to I-65 south at 15th Avenue and a second trumpet interchange with U.S. 12 & 20 (Dunes Highway). Photo taken by Don Hargraves (09/23/02). Following the ramp from the Indiana Toll Road to Interstate 65, motorists split for the freeway mainline south to Lafayette and 15th Avenue into Gary. Photo taken by Dave Sudhoff (05/21/05). Additional photos from this perspective found at Interstate 90 East – Chicago Skyway to Lake Station highway guide. The older ground level sign posted one half mile west of Exit 17 along Interstate 90 east. Photo taken by Chris Patriarca (05/26/03). A two-mile guide sign for Interstate 10 precedes the six-ramp parclo interchange (Exit 1) with U.S. 90 (Government Boulevard) along Interstate 65 south. ALDOT typically posts two-mile advance signs for Interstate to Interstate junctions. Photo taken 11/25/14. Interstate 65 southbound gains a fourth lane from the U.S. 90 eastbound on-ramp to Interstate 10. A diagrammatic overhead outlines the configuration for I-10 where three lanes default onto westbound to Biloxi, Mississippi and two onto eastbound for Pensacola. Photo taken 11/25/14. The final southbound reassurance shield of Interstate 65 stands between U.S. 90 and the Halls Mill Road overpass. Photo taken 11/25/14. Florida and Mississippi are used for the control points of Interstate 10 east and west at the south end of I-65. I-10 control cities otherwise are Pensacola for eastbound and Pascagoula for westbound. Photo taken 11/25/14. Ramps for Interstate 65 to Interstate 10 are assigned Exit number zero, but only at their separation. I-10 continues east six miles to Downtown Mobile and the George Wallace Tunnel and west 20 miles to the Mississippi state line. Photo taken 11/25/14. For additional photos see the Interstate 65 South – Mobile County highway guide. The first northbound shield of Interstate 65 stands just beyond the merge of ramps from Interstate 10. Photo taken 11/21/14. Additional photos from this perspective found at the Interstate 65 North – Mobile County highway guide. A short distance east of the collector distributor return from Alabama 193 (Exit 17) is the two-mile guide sign for Interstate 65 north (Exit 20) on Interstate 10 east. Photo taken 11/21/14. The first of two diagrammatic overheads for Interstate 65 (Exit 20) appears over I-10 eastbound at Riviere Du Chien Road. The forthcoming three-wye interchange uses left side ramps to and from Interstate 10 east. Photo taken 11/21/14. A two-lane ramp (Exit 20) takes motorists onto Interstate 65 north toward Montgomery, Birmingham and Atlanta via I-85 north. Photo taken 11/21/14. Exit 20 departs Interstate 10 east for I-65 north. Ramps from both directions of I-10 combine with four lanes leading north to U.S. 90 (Government Boulevard). I-65 remains with six lanes to Saraland as it doubles as a commuter route. Photo taken 11/21/14. Additional photos from this perspective posted at the Interstate 10 East – Mobile County highway guide. Two miles east of the three wye interchange (Exit 20) with Interstate 65 north on Interstate 10 west. Photo taken 11/20/14. The on-ramps from Alabama 163 form an auxiliary lane west to Interstate 65 north. I-10 maintains three through lanes toward Tillmans Corner. Photo taken 11/20/14. Two lanes prepare to depart Interstate 10 west for Interstate 65 north. Beyond U.S. 43 (Exit 19), the freeway turns northeastward across the Mobile and Tensaw Rivers on a rural drive 171 miles north to Montgomery. Photo taken 11/20/14. The bulk of traffic utilizing Exit 20 from I-10 west is local. The northbound freeway travels through the Midtown Mobile area accompanied by commercialized frontage roads. Photo taken 11/20/14. More photos from this perspective found at the Interstate 10 West – Mobile County highway guide. Larry Cody, email: “I-65 Terminus in Mobile Al,” August 15, 2003. Alabama Department of Transportation — Construction. ALDOT. Reconstruction of I-65. (http://www.tdot.state.tn.us/information-office/hotprojects/I-65.htm) Tennessee Department of Transportation. “Bridge plan cost soars to $3.9 billion: New plan: Build eastern span first,” by Marcus Green, Louisville Courier-Journal, December 5, 2006. “Ohio River crossing breaks ground; new bridge means better connections for people and commerce.” Fast Lane, The Official Blog of the U.S. Secretary of Transportation, June 20, 2013. “New downtown bridge named after Abraham Lincoln.” WHAS, November 30, 2015. “Abraham Lincoln Bridge opens to northbound traffic.” WHAS, December 7, 2015. “Re: I-65 downtown crossing ” online posting by cabiness42, AARoads Forum, October 10, 2016. “Re: I-65 downtown crossing ” online posting by cabiness42, AARoads Forum, November 11, 2016.